A Mid-Atlantic tradition continues this year as Jeremy Powers–pardon me, 2012 US Cyclocross Champion Jeremy Powers–returns to Maryland for the Fulcrum Coaching and JBV Coaching cyclocross clinic. While the past three years of this clinic have been nothing short of amazing, this year, with the help of the Unholy Rouleur and Squadra Coppi, promises to be even more amazing. How is that possible you ask? Simple. 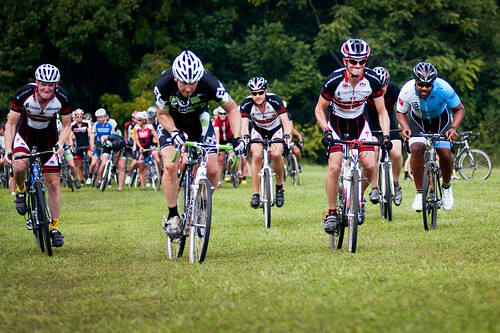 Not only will Dan Tille from Fulcrum Coaching, Chris Mayhew from JBV Coaching, JPow and two additional coaches lead attendees in a full day clinic on Saturday, September 8, but they will remain on the clock the next day to coach campers as they tackle the Super 8 opener, Tacchino Cyclocross! That’s right, Jeremy Powers will be there to do course inspection, give tips on the race and coach you up before you hit the line for your race. Along with that, camp attendees will get free entry into the race, have access to trainers, a mechanic and course-side team tent. They will also be treated to some mild heckling from the race announcer (me). If you love cyclocross this really is an amazing deal. It’s like fantasy camp for bike nerds. One note about the included race entry. Here in the Mid-Atlantic we like to play this game many of you are familiar with called “Race to Registration.” It’s sort of like a really bad video game in which you sit in front of your computer until registration opens for a particular race and then click as fast as you can hoping to be one of the first to register. This in turns determines, to an extent, your starting position at the race. That position will most likely be on the fourth row if you are first to register. Why the fourth row? Because the first two rows are given to the series point leaders. Since Tacchino is the first race, it will be the top 16 finishers from last year. The third row is reserved for discretionary promoter call-ups. For Cyclocross Camp you will be given a code to enter when you register that will waive the entry fee. So you will still be responsible to participate in the race to reg, but it won’t cost you anything extra. So that’s the skinny. A full day clinic, a day of coaching at Tacchino Cyclocross, and, oh yeah, we haven’t even mentioned the Friday night Meet & Greet and Cross Talk at Bike Doctor of Waldorf. This is a great opportunity to ask all of your ‘cross-related questions. From tire selection and pressure, to what it’s like to win a national championship and race in the world championships. Two days and one night of cyclocross submersion with some of the best instructors out there and the guy wearing the stars and stripes jersey?? At $300 it’s a freaking bargain. 2011 JBV & Fulcrum Cross Clinic from In The Crosshairs on Vimeo.